Recently I have had the need of graphic acceleration (Starcraft 2) and I don't want to setup a big desktop setup again, also I like my laptop and I don't want to change it much for the time being. On the other hand expending a lot of money on a high end laptop to play a $60 buck game it's not worth it. I got a Playstation3 so I could stop bothering with system specs and have spent more on games than on the system itself. I did some research on what's available and I found there a few offerings but they were insanely costly, around $400 for an ASUS express card video and the performance is totally not worth it. Now, a lot of "recent" laptops come with an express card connector and it's just a pci express bay plus an usb host. 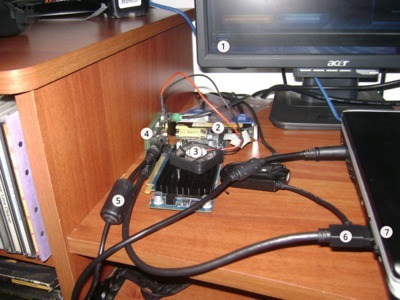 A friend suggested an idea he found on the net: Using standard form video card on that port, initially (since we're electronic engineers) we tought of building the connector from scratch, but after some googling we found there's a cheap solution (we're electronic engineers, we avoid complexity) provided by hwtools that could serve our purpose. The whole kit of express card + cable + pcie connector was $55 plus shipping, and it can be bought at HWtools. We used a 1x connector, they offer a 16x connector, but it increases the price and it's worth nothing since the express card is only capable of 1x; the only plus is better mechanical support but one can solve that for a lot less. We used the cheapest video card we could get and that was a $32 Nvidia card, since the card will be running highly handicapped it's better to use a cheap one. This one came fanless so we had to put a fan on it. I soldered a spare fan I had to the 5V on the USB connector, which I cannibalized from a dead usb memory. Get a bit better video card to avoid this, but it's better the lower-end kind of cards since most of them won't demmand external power. I had a switching power source that worked for this laying around so it was quite lucky since it's fanless and with it the whole setup just added one small fan. 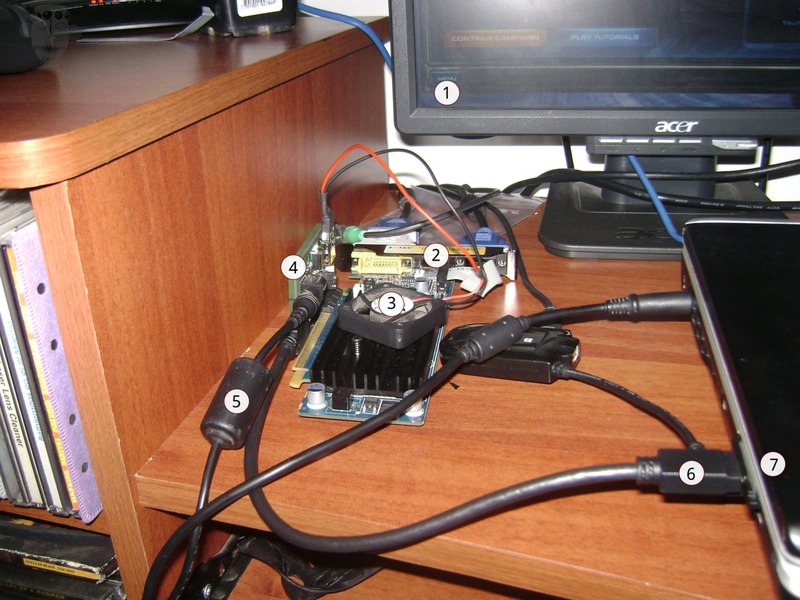 For the video card It's required a ~60W(12V-5A) power source, the connector is easy to find, and you might have the fanless switching power source from and old laptop or printer. Uf you can't get it you can use a standard ATX power source and connect it to the board with a standard floppy connector, but man these things are noisy. After you connect all this, power on the video card first and then the laptop and you will have the video card listed on the pci devices, install the drivers and setup. It's the same process as if the card were inside the case. The next step is casing and polish but the whole thing works and I can play Starcraft 2 at a whooping ~24fps on low settings with wine, my friend(@jgmejiah) reports ~20fps in medium with windows. I guess if we used a better video card we could be using better video settings but since it was the risky first try we choose to go on the cheap, I saw some videos on youtube of someone playing on ultra settigns with a similar setup and a better video card. There are several downsides to this setup, like the need of an external monitor (which I don't mind) and the fact that it's not quite portable and the extra powersource needed. But for me it's totally worth it.